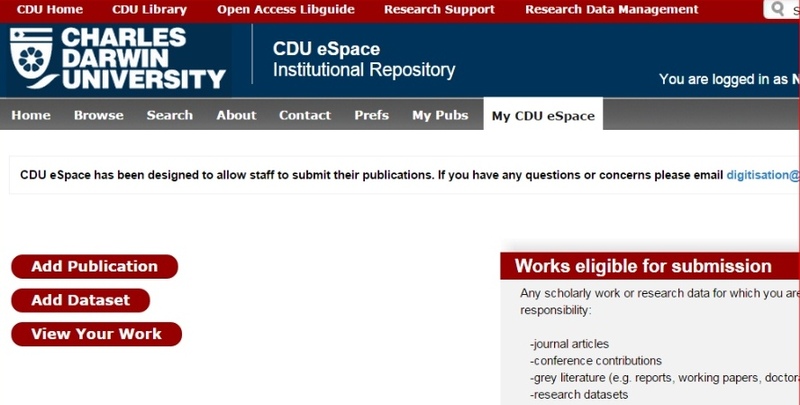 CDU's institutional repository policy requires staff to deposit accepted versions of publications into CDU eSpace. Library staff are responsible for making these openly accessible when and if embargo and other legal restrictions are met. There are two ways to make your work open access in the University's repository, CDU eSpace: by emailing your request for deposit or self-archiving. Self-archive your paper through the Self Submission portal in CDU eSpace. You will be given access to a form where you can record details about the article and upload the accepted version of your paper. Library staff will check for embargo and copyright compliance before making the final record Open Access. 1. Log in to the Self Submission portal with your CDU name and password. 3. Select the type of publication you are adding. This will take you to a form where you can supply details about your publicaiton and upload a copy (PDR or Word Doc) to CDU eSpace. The Library digitisation team will make any final edits and check for copyright compliance before making the record and file open access. What Version of Your Paper to Make Open Access? 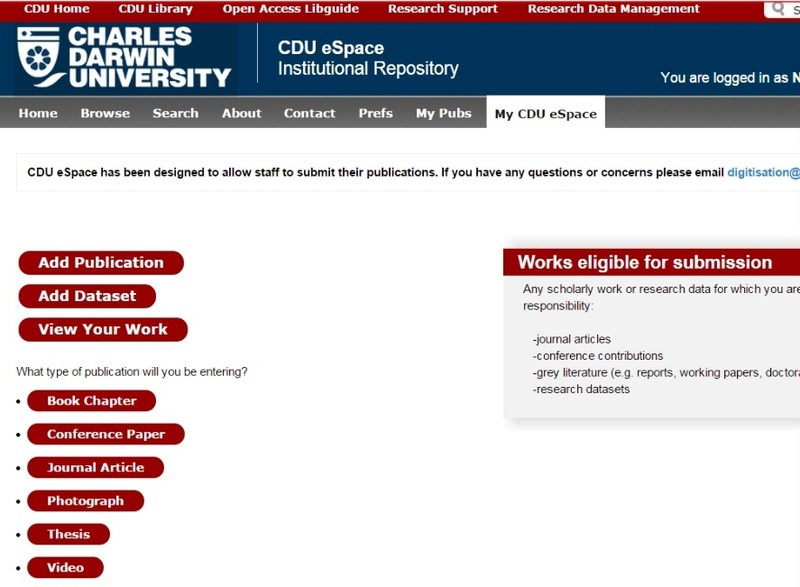 Most publishers allow the accepted version to be made open access in an institutional repository such as CDU eSpace. It is this version that should be sent to the Library or deposited directly into CDU eSpace. Library staff will ensure that all embargo and copyright conditions are met before making it open access in eSpace. The details of open access policies for most journals, including the details of versions they allow to be made open access, can be found at the Sherpa/Romeo site. But the safest and easiest rule of thumb is to submit your accepted versions to the library or directly into eSpace via the Self-Submission Portal. CDU eSpace links to the publisher site regardless of what version is made available for open access. eSpace displays bibiographic metadata for citation purposes. CDU eSpace also makes it clear to readers whether they are reading the publisher or accepted version. 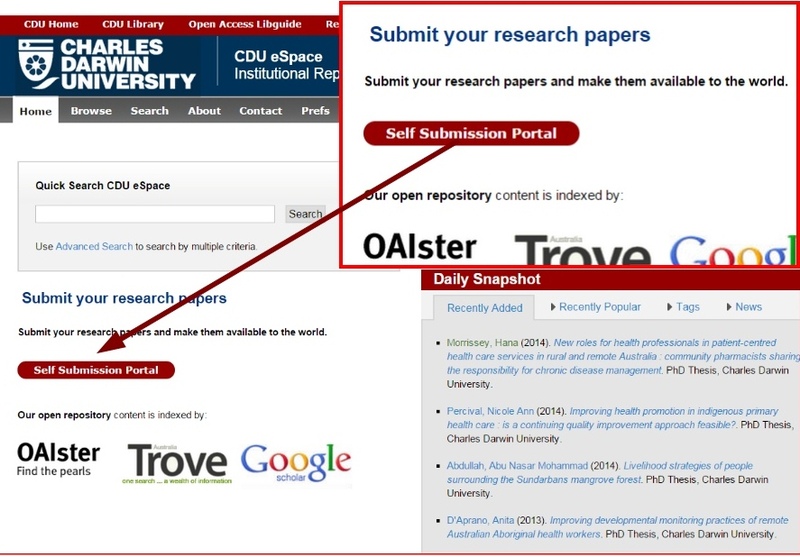 Green Open Access refers to making your work OA with publishers that allow authors to archive their articles in an online open access repository committed to long-term preservation — either a subject repository (e.g., PubMed Central, arXiv) or CDU eSpace: http://espace.cdu edu.au. 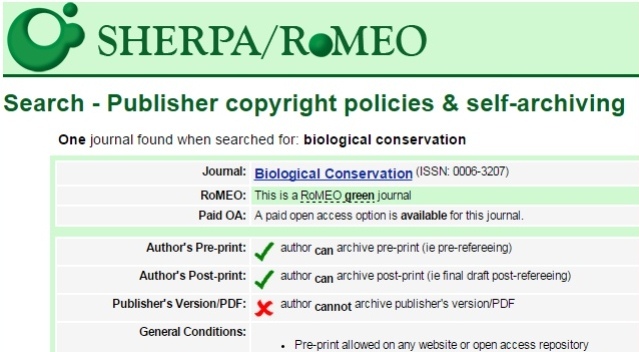 Some publishers allow the published version to be made OA but most permit the accepted version (after referee corrections are made) to be made OA. Sometimes an embargo period applies. Contact the library's digitisation team if you have any queries about a particular journal.